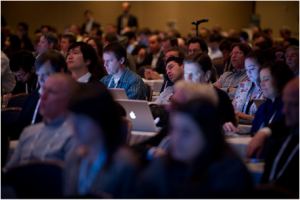 Is Following a Conference Via Twitter Worth It? Conference attendees post real-time updates on Twitter all day long so you can follow along from home. You can, but should you? There is a Twitter hashtag for everything these days, for emotions, people, activities and events. When I checked the Publishing Perspectives Twitter account on Thursday, it was blowing up with retweets and replies, all with the hashtag #bib11 — Books in Browsers 2011 — as Ed Nawotka tweeted from the conference. There was even some lively back-and-forth conversations going on about many of the points Ed mentions in his article about the conference. Many conference attendees have started tweeting out quotes from speakers and presentations, to the benefit of those who aren’t there in person. Some also post commentary on what is being said, and audience members even tweet to each other. By following the Twitter stream from an event, you get a real-time feed of pretty much everything that is going on. If you can’t attend an event and are willing to refresh your browser every minute or so to read all the new Tweets, you probably get a great idea of what is being said. And let’s be honest, if you did go to the conference, you’d probably spend your time retweeting what the guy next you just posted. But is it worth your time to follow an event via Twitter? Why spend your day following a conference on Twitter when you are missing out on the most important element of attending: the networking? While the speakers are a big draw, chance encounters and face-to-face meetings can accelerate your own business in ways you can’t really predict. Personally, I’d rather take 15 minutes to read about the conference after the fact than spend my day following the event on Twitter. But that’s just me. What’s your preference, and what is most valuable for you?